The Diamondbacks finished dead last in 2009 and 2010. Then they hired Kevin Towers as new GM and Kirk Gibson as new manager. Presto, D-Backs win the West. Well, not quite. Going by runs scored and runs allowed, the 2010 club would have been expected to win six more games than they did; the 2011 team would’ve been pegged to win six fewer games than they did. More importantly, the Diamondbacks got breakout seasons from players who’d been acquired by the previous regime (in some cases, even the one before that). Justin Upton, Miguel Montero, Ryan Roberts, and Ian Kennedy all had big years, making good on the potential that many prognosticators saw in the Diamondbacks even as they languished in the basement for two years. Still, a 29-game improvement from one year to the next doesn’t happen without at least some new blood. Towers’s greatest strength has long been his ability to build great bullpens on the cheap. 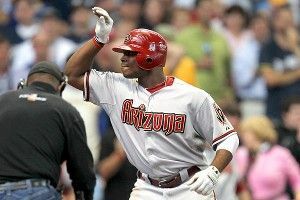 He did it again in Arizona, turning a major weakness into a strength by snagging J.J. Putz and David Hernandez. This off-season Towers upped the ante, signing Trevor Cahill to deepen the rotation (which should help) and Jason Kubel to play left field (which might turn out to be a mistake). It all adds up to Arizona entering the 2012 season as favorites to repeat in the West. Two projections stand out here. Bloomquist would be the worst leadoff hitter in baseball by a wide margin if he puts up a .282 wOBA in that spot. It wouldn’t be a stretch to see Bloomquist put up that kind of offense either; while his performance last year replacing the injured Stephen Drew was perceived to be serviceable, he hit just .266/.317/.340 in a hitter’s park (.291 wOBA) and played below-average defense. Bloomquist (and Aaron Hill, really) batting at the top of the lineup makes no sense; generally speaking, you’re best off giving your worst hitters the fewest at-bats. Meanwhile, Drew’s nasty ankle injury and the length of his absence could be the biggest factor working against the D-Backs right now. The other interesting prediction is Goldschmidt’s, as Bill James appears to be in love with him. The hulking first baseman is projected to battle Upton for the title of top Diamondbacks hitter, which would be a huge lift for Arizona if the prophecy comes true. In left field, Kubel’s slated to be the starter. Towers wanted lefty pop to balance the Diamondbacks’ lineup. But benching Gerardo Parra, a passable hitter whose Gold Glove-caliber defense might make him a better overall player than Kubel, could prove to be a bad decision. Advanced metrics tend not to love Cahill given his subpar strikeout rate (5.48 strikeouts per 9 innings) and his sometimes iffy control (3.55 walks per 9 innings in 2011, 3.35/9 IP for his career). But Cahill does benefit from extreme ground-ball tendencies (56 percent GB rate over the past two years, fifth-highest in the majors), a trait that should serve him well as he moves away from pitcher-friendly Oakland to homer-happy Chase Field. He also posted big strikeout rates for a good chunk of his minor league career, portending possible improvement in the big leagues (his 2011 K rate was already one better per nine innings than it was in 2010). At the very least, the D-Backs have snagged a pitcher who can chuck 200 innings of league-average (or slightly) better ball. That’s an especially valuable commodity to have given Joe Saunders’s perennial hitability and Josh Collmenter’s uncertain future (his so-so pedigree might be a better predictor than his promising rookie season). I’ve written before about former UCLA phenom Trevor Bauer, his unorthodox training methods and his massive upside; he’s a leading Rookie of the Year candidate who could be the team’s third-best starter from the moment he gets promoted and throws his first big league pitch. With Putz, Hernandez, and company back for another round and Kennedy and Hudson poised to lead the rotation again, Arizona’s pitching staff should be in good hands. Goldschmidt. He’s got 30-homer potential over 150-plus games, possibly coming to fruition as soon as this year. Keep an eye out for possible improvement by Cahill, too. And while Upton already had a big breakout in 2011, he’s a solid preseason MVP pick for 2012. The D-Backs repeat as NL West champs, then ride their improved starting rotation all the way to the World Series, giving Arizona a shot at its second World Series in the franchise’s short history. Regression from 2011 breakouts Kennedy, Roberts, and company, Drew’s ankle doesn’t heal quickly enough leading to Bloomquistmageddon clogging the lineup, Putz’s injury woes act up, and the team finishes third behind the pitching-rich Giants and hard-to-read Rockies.